This store is located LEFT of Alamo Drafthouse Cinema. 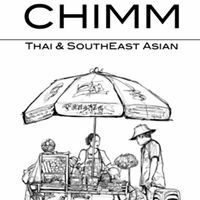 We at Chimm are so excited to be a part of the growing culinary scene here in Charlottesville. While we mostly serve Thai and some other Southeast Asian cuisine, we never claim to be “the best” as we know there are many variations on dishes from different regions. We love that there is no one exact way to make a dish, which makes it fun for our fellow Thai restaurants to enjoy each other’s establishments. This also makes it great for the community as well, so we can find the version that works best for us.